Way back in the ‘80s, when I was a teenager with a resplendent mullet, the explosion of fantastic metal bands appearing on the scene often made it seem like all it took to make great music was denim, leather, and a hefty amount of amplified attitude. Obviously, some actual guitar-god and/or frontman genius was always a bonus, and a stack of Marshalls as a backdrop helped enormously too, but there was a rough-necked, unbridled enthusiasm to the metal scene back then, where many bands exploited metal’s over-the-top attributes to their nth degree. Thankfully, plenty of bands today still exhibit a devotion to metal’s early sonic signifiers and, more importantly, to that accompanying gusto–and that’s certainly an attitude that Wellington, New Zealand-based five-piece Red Dawn shows in its commitment to energetic and definitive heavy metal. The band’s new EP, Ironhead, offers 30 thundering minutes of driving metal, where visceral thrash meets the hammering harmonies of NWOBHM for a hugely enjoyable and bombastic journey overall. Red Dawn features in its ranks one of New Zealand’s best drummers, Steve Francis–who’s appeared before on Metal Bandcamp, sitting behind the kit for black metal (and gutter-punk-friendly) outfit Bulletbelt. With Red Dawn, Francis steps away from the bitter and bloodthirsty mood of Bulletbelt, to rip into the full-bore supersonics of power-metal. And with Ironhead opening with the heavy-weight ignition of a Harley-Davidson (followed by a lyrical thread that sees the, “Bonds of society now forsaken”) the grease-streaked, turbo-injected metallic tone is set for the entire EP. Thematic call-backs to the likes of Saxon and Manowar are there on “Ironhead”, with Ed Hintz’s vocals bringing the Dickinson and Halford operatic highs, while guitarists Andrew McGregor and Dan Hayston weave a mix of early Megadeth-esque riffing around the gallop of Iron Maiden. “No Man an Island” takes its inspiration from the metaphysical poetry of John Donne, casting it in a more modern light as mid-tempo melodic thrash, fiery NWOBHM-worthy soloing, and the corpulent rumble of bass catapult the song along. Red Dawn brings tales of historical import on “Death March of Bataan”, tackling the grim reality faced by US and Filipino troops at the hands of Japanese forces in World War II; and martial percussive bursts, and bombarding, breakneck thrash set the song’s warlike temper perfectly. Elsewhere, the lightning-strike of “Rootshell" delves into lyrical themes of cyber connections and Big Brother intrusions, while “Prisoner” sees Red Dawn explore the psychological surrealism of the cult TV show of the same name with a grand cinematic epic–all dispensed with fitting traditional metal gravitas. Ironhead’s production finds a great balance between the scrappy bite of upbeat guitars, wonderfully histrionic vocals, and the band’s crunching and propulsive rhythm section. The EP contains abundant six-string spiritedness and ramps up that vintage sense of old-guard metal theatrics without ever drifting into pastiche, which sees Red Dawn’s triumphant songwriting fall into the orbit of similarly expeditious acts like Enforcer, or Holy Grail. Overall, Ironhead finds the grunt and punch of the likes of Manilla Road, Slough Feg, or Judas Priest blending with speed metal’s shred (right at the point where that whirlwind scene was evolving into thrash). Red Dawn hasn’t forgotten the whole-hearted enjoyment to be found in the unadulterated, fist-pumping metal of the genre's early years, with firebrand sprints up the fretboard seeing traditional and thrash metal melodies and solos duelling, and Hintz’s vocals having full-blown ‘classic’ metal frontman written all over them. 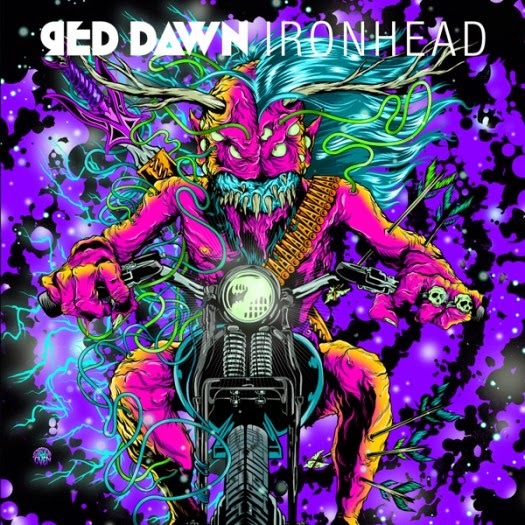 However, as much as Red Dawn’s stentorian songs draw from the strengths of metal traditionalism, it’s also important to point out that Ironhead doesn’t set out to further the reach of any retro-metal movement per se. Instead, while the EP successfully underscores that metal’s fundamentals are as powerful, propulsive, and entertaining today as they ever were, Ironhead also exhibits a rock-solid contemporary groove in parts. That proves that while Red Dawn has looked over its shoulder for inspiration, it’s definitely looking forward too–no doubt with a steely gaze set on securing its rightful place, in metal’s future.